This is the cardigan from the Options KAL with Rowan's Pure Wool Superwash DK. This CustomFit pattern will give you a basic, Stockinette sweater with the shape shown. 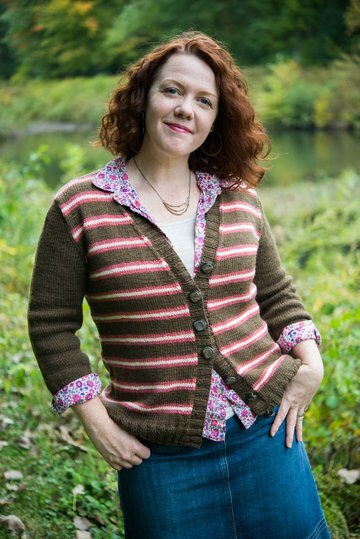 What kind of fabric you make the pieces out of is totally up to you - although the cardigan here is shown striped, please see the Options KAL page for your choice of fabric patterning - plain (as written here), Striped, or Texture. Pictured in hourglass silhouette. Also available in a-line, straight, and tapered silhouettes. Please see our page on silhouettes for a full explanation of silhouettes in Customfit. Approx. 45 (50, 55, 55, 60, 65, 70, 75, 80, 85, 90, 95) yards of CC2. Silhouettes: Pictured in hourglass silhouette. Also available in a-line, straight, and tapered silhouettes.